A retaining wall is a wall built to rebut the pressure of earth, either wet or dry. In designing such a wall it is necessary to ascertain the character of the material to be retained. If the latter is rock, the wall evidently need not be as thick as if the material were wet clay, and would be merely a face wall. Any granular material, when unconfined, spreads out to its natural slope, termed technically the angle of repose, which varies with the material and also with the quantity of moisture in it. The slope usually taken in engineering work, as being safe for nearly all kinds of earth, is 1 1/2 ft. horizontal to 1 ft. vertical, corresponding to an angle of 33° 42'. The pressure, then, which a retaining wall sustains, is evidently the weight of the prism of earth included between the back face of the wall a b, Fig. 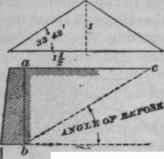 23, and the plane b c, inclined to the horizontal at the angle of repose of the material - the earth having a level top surface. The amount and direction of this pressure are indeterminate, and so many varying fa< enter into the problem that no attempt will be made to explain the theory of retaining walls, and only a few practical points will be touched on respecting their design. There is considerable diversity of practice in the proportioning of retaining walls. Most authorities, however, agree that the base should be from .3 to .5 of the height, the If ratio being the greatest required under any but the most unusual conditions. The following proportions represent very safe - but not excessive - construction: In Fig. 24, let ah = 1; then gk = .4; ab = 1/6; gh = 1/12; cd,ef, etc. = from 9 to 12 in. each, the distance i k being divided up so as to make steps of about these widths. For example, let ah = 16ft. ; then g k = 16 X .4 = 6.4 ft., say 6 ft. 6 in. ; g h = 1/12 of 16 ft. = 1 ft. 4 in. ; ab = 1/6 of 16 ft. = 2ft. 8 in. ; cd, etc. = (gk-gi) / 3 = l0in. The preceding proportions are not intended to apply in their entirety to small walls less than about 6 ft. high; in such cases steps are usually unnecessary, and the top width should not be less than 18 in., so that the wall may be sufficiently thick to withstand the action of frost on the backing. A wall designed as above indicated will be amply strong to retain a considerable surcharge, or bank, of earth sloping back above the top of the wall. Area walls that are supported at short intervals by cross-walls, beams, etc. do not need to be as thick as retaining walls which have no such bracing. The masonry courses, while usually laid horizontally, should preferably be laid sloping towards the embankment, to lessen the liability of slipping, and should be started below the frost line. The stones should be as large as possible, bonding and breaking joints both longitudinally and transversely. If built of brick, the bond should be the same as stone, with broken joints, wherever possible, to make the wall a homogeneous mass. The back should be left rough, to increase the friction between the wall and the backing, and, as the work progresses, it should be coated thickly with hot coal tar, or other waterproof material, as a precaution against water soaking in. Above the frost level, on the upper surface of the embankment, the back of the wall is sometimes battered sharply up to the coping, as at I m, Fig. 24. to guard against displacement by the action of frost upon the backing. To prevent the accumulation of water at the back of the wall, porous drain tiles should be laid at proper levels along the back of the wall, to collect all surface and rift water, and discharge the same through small openings, called weepers, left in the wall for that purpose. The natural drainage of the soil never should be dammed up by a wall.